The kind people at Rude Health sent me a whole box of dairy-free 'milks' as part of the relaunch of their Oat Drink (from June it will be gluten-free), which is pretty exciting. It was a great opportunity to do a tasting – after all how often do you get the chance to try a whole collection of these milk alternatives in one go? So I got some friends round, we put our best wine tasting skills to a slightly unusual use and started to sip, swirl and generally mull over tastes and aftertastes. 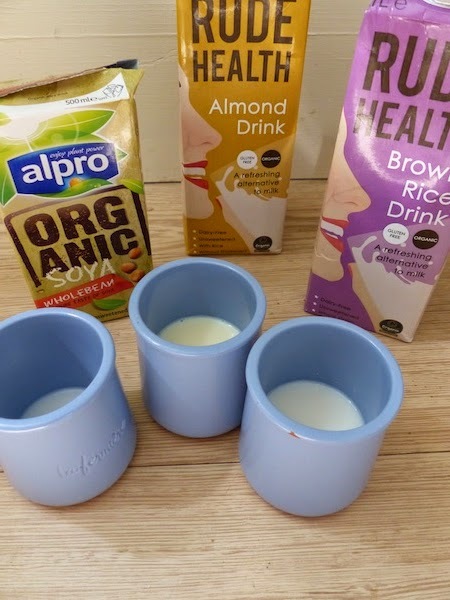 As well as an almond drink, oat drink and rice drink we added Alpro unsweetened soya milk, Koko's coconut dairy-free alternative and some real milk. What I learnt is that they are wildly different - much more different than I was expecting, in fact. - Almond drink: Naturally sweet with an almost floral taste - tasted sweeter than real milk. - Rice drink: Another naturally sweet drink, but this time with quite a neutral taste. Probably my least favourite in terms of drinking it purely by itself. - Soya milk: Really quite an earthy flavour that did make you think a bit of beans. Slightly bitter with no obvious sweetness. - Oat drink: Among my favourites, though this wasn't shared by everyone. There was a smooth initial flavour that was probably the most similar to actual dairy milk of all the types we tried, though there was also a slightly bitter aftertaste. - Koko dairy free: Slightly sweet with a trace of coconut flavour and a creaminess that lingered. - Real milk: The semi-skimmed I tried seemed overly creamy after all that lot and to be honest wasn't even the nicest of all the drinks available.